This anthemic number about leaving one's hometown was debuted during a commercial from RED and Bank of America that aired during the 2014 Super Bowl on February 2nd. RED is an international charity dedicated to raising funds and awareness for HIV and AIDS, which was co-founded by Bono in 2006. The song was made available as a limited-edition free download on iTunes for the first 24 hours after the Super Bowl commercial aired. For every download during that time, Bank of America promised to donate $1 (up to $2 million) to the Global Fund to Fight AIDS, Tuberculosis and Malaria in many of the world's poorest countries. According to the band's website, by the time the free downloads ended the total sum raised was $3,138,470. 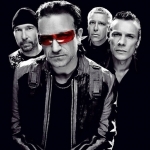 Bono told DJ Zane Lowe on his BBC Radio 1 show that the band thought back to their late '70s roots for this song and the rest of the album. "We listened to all this extraordinary music in the late '70s and started to think about those times and the things that made us who we were," the U2 frontman said. "We went back to why we wanted to be in a band in the first place. It opened up a whole valve for me writing and it was a dam burst of sorts. Punk rock and electronic [music] was when it started for us. We were listening to the Ramones and Kraftwerk and you can hear both of those things on 'Invisible.'" The Mark Romanek directed music video was shot in a Santa Monica airport hangar over three days in January 2014. One Hour Photo director Mark Romanek's resume includes such classic music clips as Jay Z's "99 Problems," Johnny Cash's "Hurt" and Michael and Janet Jackson's "Scream."